Visit Royal Panda Get your bonus! "An outstanding online casino with a great deal of online slots and other games!" Royal Panda Casino uses the latest online security protocols from COMODO and its games are verified for being fair. Safe withdrawals completed instantly or in just a few days. Royal Panda Casino may attach a pending period of one day to a payment request to guarantee the best security measures. Join Royal Panda Casino right now and get 10 free spins upon registration to play Starburst. After that, the first deposit will be matched with a 100% bonus that can reach $800. Just choose the deposit method and select the welcome bonus. The ultimate online casino experience is not just for royalty. This online casino has taken some of the very best gaming creations found on the net and brought them under the same virtual roof to make sure that players from around the world can connect and start having immense fun. Royal Panda Casino is actually one of the top new names and although it was only established in 2014, it already has a massive following. Some of the reasons for its growing success include a nice welcome bonus with easy wagering requirements, a secure instant play platform, hundreds upon hundreds of great casino games and much more. The services running in the background are up to par with the rest of the offering as well. Banking can be made through various methods and in different currencies so international players will feel right at home here. There are also a few languages for the website to push this point even further. Its mascot lives up to the Royal Panda name and is frequently featured throughout the website, either presenting a promotion or just playing on its tablet. Yes, the online casino is compatible with mobile devices and unlike other sites, it keeps an impressive amount of its gaming collection and brings smartphone or tablet users more than 230 games directly to their fingertips. Royal Panda Online Casino is regulated by the Malta Gaming Authority for most markets and by the Gambling Commission in the UK for citizens from the country. The website is secured at all times and the encryption protocols used are far above the standard measures in the industry. If there is something that stands out from the Royal Panda Casino review, it has to be the gaming platform. With contributions from multiple top software providers, the list of games is not only huge but also packed with great options. Developers like NetEnt, NextGen Gaming, Microgaming, Evolution Gaming and ELK have highly regarded creations which they proudly show off on the site. The lobby is actually pretty simple and since a download is not needed to start playing, basically any game is just a couple of clicks away. We start with video slots because most real money casino players will head over to the spinning reels as soon as they register. Royal Panda has more than 420 slots games and all of them have something unique to offer. There are also tens of progressives, including millionaire makers like Mega Moolah, Halls of Gods, Mega Fortune and Arabian Nights. While video slots aim to take players away in magical worlds with their graphics, the table games are designed to be as realistic as possible. There are various options for fans of blackjack and of roulette, along with tables for casino hold'em, craps, baccarat and poker. Taking it one step further are the live dealer games. Here, Royal Panda combines standard options from the providers with its own live casino for a more personal touch. The result is a selection of 16 games with different tables and croupiers that can really create a real casino experience on the screen of your desktop computer, laptop, tablet or even smartphone. The casino online supports multiple trusted payment methods. The most frequently used ones are Visa, MasterCard, Skrill, NETELLER and Paysafecard but the cashier can also show several other options, most of which are only used in certain countries. Royal Panda aims to make the entire banking process very simple so deposits are instant, come with 0% in casino fees and have large limits that normally start at €10 and go up to €15,000. If EUR is not your preferred currency for playing online casino games with real cash, there are plenty of other options to choose from. USD, GBP, SEK, NOK, NZD, PLN, MXN and INR are all accepted at Royal Panda Casino and the choice can be made when registering an account. Secure withdrawals are completed very fast, although there aren&apos;t as many banking methods to choose from here as we would have liked. Bank transfers and payments to Visa or MasterCard are completed in 1-5 days, while withdrawals using NETELLER or Skrill are instant once the casino pending period is over. New players are often times encouraged to join through special offers that are only available on the first deposit. This is most commonly known as the welcome bonus and Royal Panda Casino may not have a very big number here but that doesn&apos;t mean it is not a great promotion. The welcome bonus consists of 100% of the first payment transferred as bonus credits in the account, up to $800. There is also an additional incentive of 10 free spins that will be granted once the account is created, without having to make a financial transaction first. These 10 free spins can only be played in the video slot game Starburst. The bonus money on the other hand can be used to bet on video slots, video poker, table games, live dealer games and on the other options in the casino. There is a wagering requirement of x35 for the received bonus amount. This means that the player must bet €3,500 on a deposit of $800 before being able to withdraw real money from the account. Bets on slots, scratch cards and on soft games will count 100% towards meeting the requirement, while wagers on table games, video poker and on live games are only worth 10%. Overall, the playthrough requirements are fairly standard and actually lower than what most online casinos ask nowadays. The loyalty program used is unique to this online casino. It is nicely called the Loyal Panda program and it can give players the freedom to choose what rewards they want to get. The first step is to place a real money bet on the games. This will result in Loyal Panda Points, or LP Points for short. All new players are started on the Bronze level but can move up by getting more points. Silver requires 15,000 LP Points, Gold is at 45,000 and Diamond is reached when getting 120,000 LP Points. The level determines what perks are offered. Accumulated points can also be exchanged for various gifts in the Loyal Panda Shop that can include free spins, iPhone 7, iPad Pro, tickets to Las Vegas, bonus funds and much more. The list of promotions will also show some long running offers, like the weekly €150 bamboo bonus consisting of 50% on a deposit. 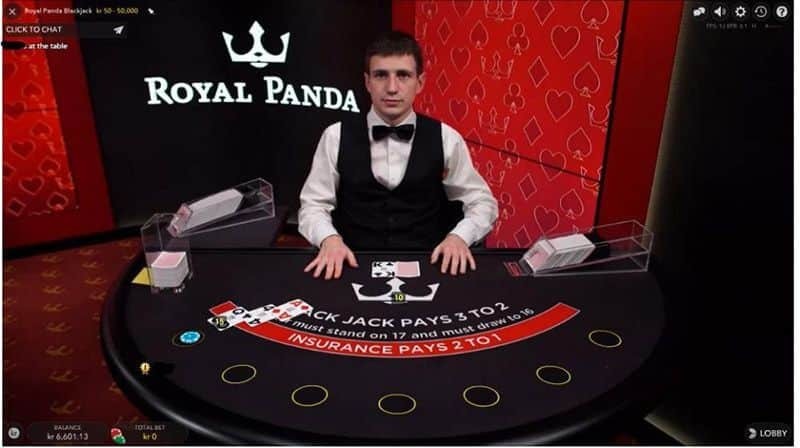 There is also a Blackjack bonus for the Royal Panda Live version of the game where getting 21 at the table on the 21st of the month can result in a €210 bonus. Sometimes, special promos are added to the casino as well. Plenty of mobile slots and mobile table games are provided by Royal Panda. Since the many games are already on the website, in instant play, it is just a matter of which ones are compatible with mobile devices. Also, some creations have special versions for smartphones, such as most of the big slots from NetEnt. The mobile casino takes care of all of this and much more to give customers more than 230 casino games when on the move. These are not limited just to video slots and also include blackjack, roulette, video poker and even live dealers. Some of the biggest mobile casino games right now are Mega Moolah, Jack and the Beanstalk, Gonzo's Quest, Lost Vegas and Thunderstruck II. Since the titles have been optimized for smartphones and tablets, there can be some differences in how the controls look but nothing has been changed when talking about the actual game mechanics. Royal Panda Mobile Casino works instantly on Android phones, iPhone, BlackBerry, Samsung Galaxy tabs, Windows phones and other similar devices. The only thing needed is to just go to the casino web address and the site will do all the rest. 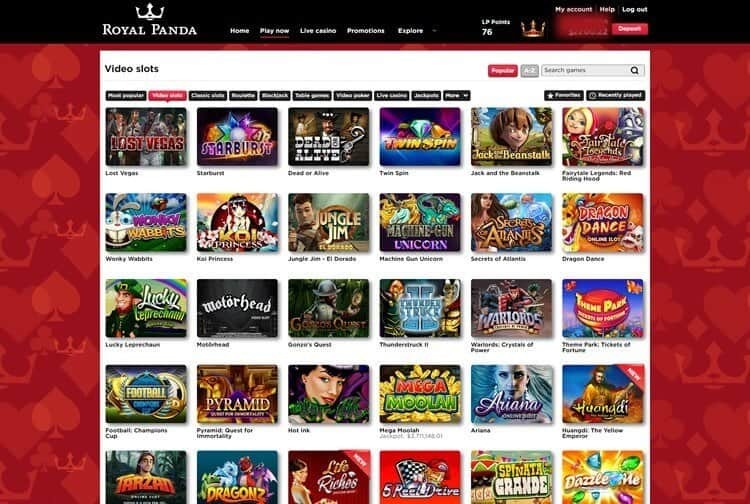 In addition to its instant lobby that is simply packed with awesome casino games, Royal Panda also has a nice looking website and knows how to take care of its customers. From the welcome bonus and to the convenient withdrawal methods, everything is perfectly organized so that players can just enjoy their time and win real money prizes from their favorite games. Another thing that stands out from the Royal Panda Casino review is the mobile website and the optimized slots that come with it. All in all, there aren&apos;t many online casinos that can honestly claim to be better than Royal Panda. This is a great time to join and see how it is firsthand. Join Royal Panda Casino and get 100% on your first deposit!